San Diego, CA, August 3, 2007 -- The Global Ocean Survey, a recent scientific voyage of discovery, has acquired the largest metagenomics data set in existence to date, giving scientists unprecedented amounts of data to sift through in exploring a radical new view of life on Earth, one that is genetic sequence-centric rather than organism-centric. Now ATLAS in silico, an ambitious art-meets-technology project presented on the world's only 100-million-pixel autostereographic display, allows the public to swim virtually in the data and experience first-hand this radical new view of the world. ATLAS in silico: Luminous geometric forms representing proteins from the Global Ocean Survey and social and environmental data from geographic regions adjacent to the sampling sites. 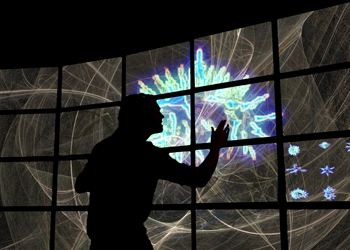 The interactive artwork will premiere during SIGGRAPH 2007, the annual conference of computer graphics and interactive technologies, which will attract 25,000 people to the San Diego Convention Center and satellite locations. ATLAS in silico will be on display August 4-6 during SIGGRAPH at the California Institute for Telecommunications and Information Technology (Calit2) on the UC San Diego campus. "This is a new media art work that reflects upon humanity's long-standing quest for an understanding of the nature, origins and unity of life," said Ruth West, artist-in-residence and director of visual analytics and interactive technologies at the National Center for Microscopy and Imaging Research (NCMIR). West conceived of the project when she learned that Calit2 would be building the cyberinfrastructure to host the genomics data from the Global Ocean Survey. "I could imagine walking down the hallway in front of the server room with the GOS data and swimming in this oceanic field as my shadow interacted with the data." The genomic data for ATLAS in silico comes from the Community Cyberinfrastructure for Advanced Marine Metagenomic Ecology Research and Analysis (CAMERA), based in Calit2. CAMERA is a repository for sequences and metadata associated with microorganisms collected by genomics pioneer J. Craig Venter every 200 miles during his GOS circumnavigation of the globe. When the first batch of data was released in January, it became the largest known protein sequence data set -- doubling the amount of protein data gathered over the previous 30 years. 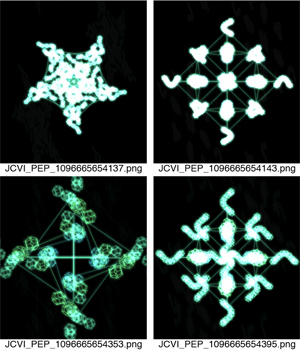 Movements within an ocean of metagenomic data are modeled on fluid dynamics, and each protein in the database is given its own unique visual signature (e.g., in the tile above the right-bottom corner of the display). Building on the massive database of DNA information about ocean-dwelling microbes, West collaborated with a team of 18 artists, biologists, computer scientists and engineers to push the envelope of available audio and visualization technologies. These include infrared head tracking, advanced networking, as well as spatialized, multi-channel audio that creates a sonic microworld. In addition, a customized computer-vision hand tracking interface paired with a 100-million-pixel, autostereographic display allow the viewer to see and interact in real time with stunning three-dimensional graphics -- without 3D glasses. The audio for ATLAS in silico will also premiere a newly-developed hybrid strategy for sound rendering in immersive virtual reality, combining amplitude, delay and physical modeling-based, real-time spatialization approaches for enhanced expressivity and spatial depth in the virtual sound environment. "We took an extremely complex artistic framework and brought it to life by pushing the limits of existing systems and creating entirely new technologies where needed," said Todd Margolis, the project's technical director and a researcher in UCSD's Center for Research in Computing and the Arts (CRCA). The project garnered support from industry and academic sponsors. Meyer Sound Laboratories is one of several participating companies, including Active Motif and Mental Images. Academic supporters include Calit2, CRCA, NCMIR and the CAMERA project, as well as the San Diego Supercomputer Center and the University of Illinois at Chicago's Electronic Visualization Laboratory. "This project builds on Calit2's innovative display, cyberinfrastructure and metagenomics technologies and is a wonderful synthesis of art and science," said Ramesh Rao, director of Calit2's UCSD division, who provided support in addition to the guidance provided by Calit2 director Larry Smarr, who is also the principal investigator on the CAMERA project. Using hand movements to 'bring forward' up to 60 records from the GOS data set. According to West, who is affiliated with both Calit2 and CRCA, the title of the work refers to a visual atlas mapping the foundations of microbial life in the ocean, and the tools "facilitated by silicon" to explore and understand this new trove of scientific data. "The Global Ocean Survey gives us a new view of the world as important as the first time we saw the Earth from space," she said. "With ATLAS in silico, we're creating an artwork that brings this new view into a human context and enables the public to playfully and intuitively experience what is normally invisible." In parallel to the historical challenges that Darwin's work on natural selection posed to representations of nature in 19th Century visual culture, ATLAS in silico embodies the current challenges that metagenomics poses to our 21st century ability to represent nature. It also invokes a renewal of a closer relationship between science and art, as practiced by Darwin and his contemporaries. As viewers explore the immersive environment, they encounter luminous geometric forms representing proteins from the Global Ocean Survey that are as richly detailed as the drawings of Ernst Haeckel, a 19th century German artist, naturalist and biologist who was the first to name and illustrate thousands of species of marine microorganisms. "This visual richness is contrary to our usual experience of data as 0s and 1s in our computer's hard drive," said West. Sorting through millions of records from a search would be daunting, but experiencing them all at once as a virtual world allows larger patterns to emerge and become visible. 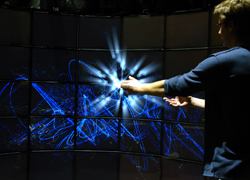 To allow visitors to interact with the data, the collaborative team developed a computer-vision interface using optical 'marker-less' tracking that allows the viewer to use hand movements to direct patterns on the display and pick out sets of data by "pulling" them away from the screen in 3D. "We're breaking all the rules here," West said, of ATLAS in silico 's strategy for mixing biological and social data. "But we're hoping that this will open the door to new ways of representing nature in an era when the knowledge that GOS offers us is critical to our collective future." For additional information visit: http://www.atlasinsilico.net .